The picture shows how excited I am to finally do this. My hand is shaking that time when I took the photo. Sorry for slightly blurred picture. Anyway, one of the most awaited day and milestone for our son is to have his haircut. That day, we celebrated his first birthday. After eating our lunch, we headed to a hair salon. Cuts4Tots Hair Salon offers haircut to kids from 0 age and above. Other services are, adult haircut, bang trim, shampoo and blow dry and hot oil treatment. 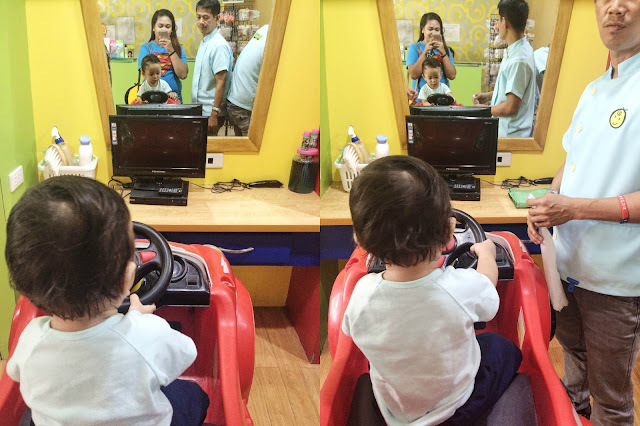 Kids will sit in a toy car while having their haircut. It's supeeeerrr cute. 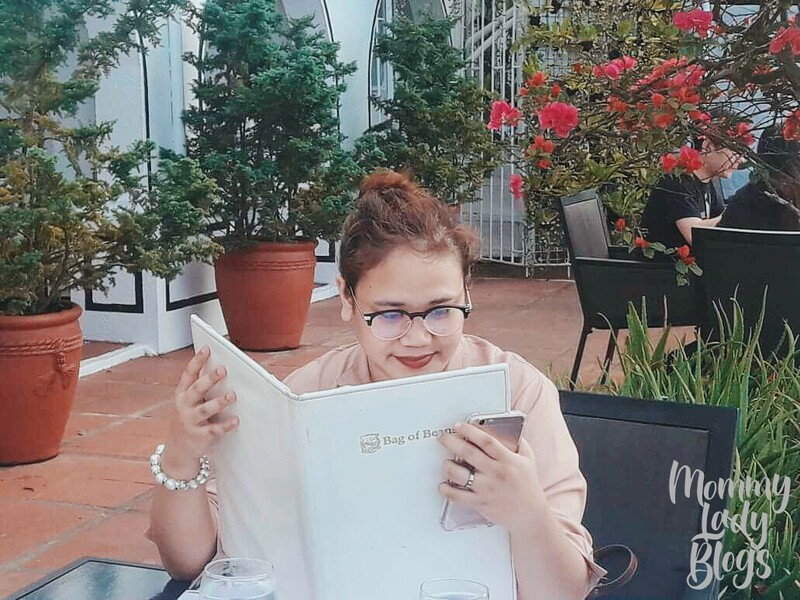 The environment and ambiance is very kid-friendly. They have a small flat television in front to keep them entertained. When we entered the salon, I saw a young girl watching a Barbie movie while having her haircut. It is one of my favorite movie, The Princess and The Pauper. Oh, childhood memories. Going back, other than movies or tv shows, there are toys as alternative to keep them busy. First, the barber put a vape/cover around Prince's body to prevent his hair from falling on his clothes. I know my son's hair looks fine, and some of our relatives told us not to cut his hair but due to extremely hot weather I have to. I saved some photos in my phone just in case the barber will ask me what style do I want and yes, I showed one of my favorite photo I saw on the internet. One of popular hair styles nowadays are undercut and it is one of the style I am aiming for my son. Hoping it will looks good on him, so here we are shaving his head and remaining the top part. He was so quiet and cooperative at first but after a few minutes, he was trying to get out of the car and moving non-stop. We tried giving him toys and one of the staff play some bubbles. When he saw bubbles, he stopped for a while and went back on being active. At the end, he was crying so hard. I thought the shaving part hurts him but the barber assured me it's not. Maybe my son was feeling scared. Anyway, it only took us a few minutes, I guess 10-15 minutes to finish his hair cut. Tadaaaa! I am so happy with his haircut. Until now, I am so amazed with his new look. He don't look like a baby anymore, more like a young man. Last Sunday, we went to a birthday party and we tried experimenting his hair and put some wax on it. Not a bad idea right? His haircut really looks good on him. I am so happy with the service we got and will definitely go back for his second hair cut. For his haircut, we paid P330.00. 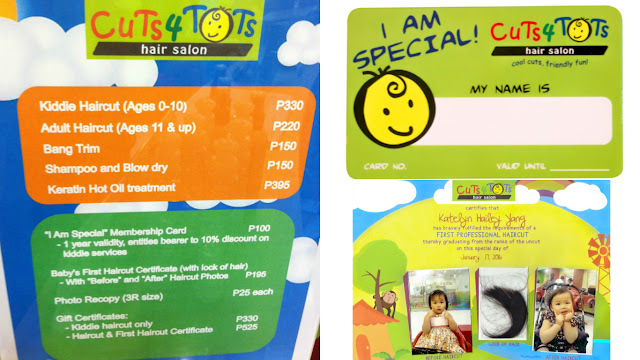 They offer First Haircut Certificate for P600.00. It includes before and after photo plus your little one cut hair. If you are planning to be a regular costumer, you must avail their membership card. *NOTE: Don't forget to bring your little one an extra clothes to change after his/her haircut. 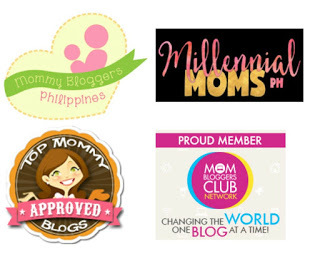 Other branches are Eastwood Mall, Fairview Terraces, Glorietta, Robinson's Place Manila, and SM Mall of Asia. Check http://cuts4tots.com/ for more info. Wow, he looks so proper just sitting there while the barber cuts his hair. I know many first timers would often end up crying. Php 330 for a child's haircut isn't so bad. We pay 250 at a regular barber's shop in market market because the cost in kiddie salons are just too high nowadays. Sayang Megamall. Maybe when we finally get our car back, we can try it out. Cool do for your cool kid! :) I remember how excited I was, too, when my eldest had his first haircut. So relate! Witnessing our kids' milestones is truly something big for us parenst, even if it's just having a haircut. 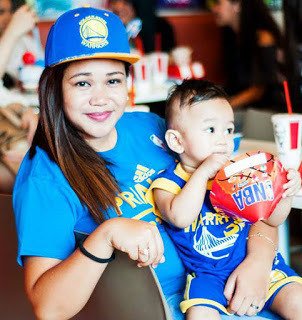 :) I also bring my kids to kiddie salons for their haircut and it's helpful that they have nice seats like toy cars to keep the kids busy. My son also had his first hair cut at Cuts 4 Tots. The staff were so nice, patient and they knew how to calm the kids (and moms too!). We had several haircut sessions with them until we decided to bring our toddler to our neighborhood barber shop. 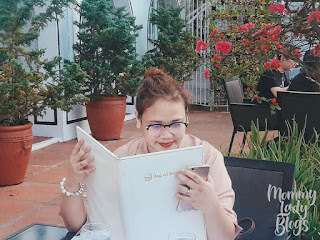 Mas masaya, bonding moments nila ni Tatay at mura pa! Thanks for sharing this! Hi Prince. Love your hair, too. Looking astig yet cute pa rin. My kids used to love cut for tots. Get a card, for every visit they will stamp it and once completed, your 12th visit will be free. Your son seemed to enjoy his first haircut. I couldn't say the same for my son. He cried a lot when he hears the sound of the clipper. So glad he's gotten over that fear already. Ooh handsome boy! I love undercuts on young boys, but I can never get my son to have his hair shaved. WW3 will commence! Your son is a LOT more cooperative than my 4-year old LOL! Hello there, young man! :) My dad's looking forward to my son's first haircut. But my mum keeps saying we have to wait till he turns 1. (Another but) We wanted to grow his hair long. :) So I don't know. Hahaha! We'd definitely try this when we decide to trim his hair. 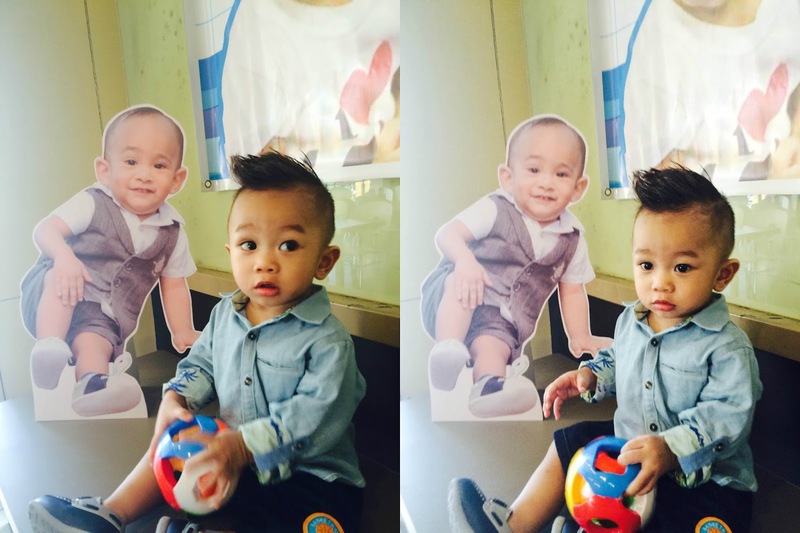 Wow your son looks cute and mukhang na-enjoy nya ang first hair cut nya. 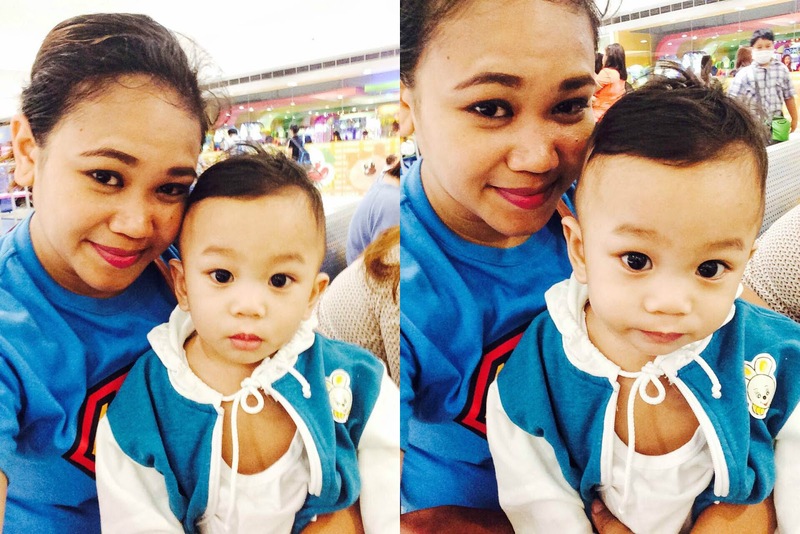 I remember my son's first hair cut, ang behave nya. Hehe. Sooo cute. I've seen some of these barber shops for kids before and I can say theyre very creative. We've gone so far from threatening kids that their ears will be shaved if they don't sit still. Your son looks so gwapo with his new haircut. I like it. Super good boy! Santi cried on his 1st...and 2nd haircut. Haha! wow ang cutie ng outcome! And he looks behave ha? Naku when I got my twins very first haircut sa barbershop, nagwala sila! I see a lot of these kiddie salons! Wish we had them when I was younger haha! Your son looks cool in his new 'do. What more can be exciting than bringing your kid on his very first haircut! Another precious milestone that needs to be documented! Did you kept some of the hair? Cutie Prince! I once take my son to a kiddie salon for a haircut, he was wailing the entire time. so I learned to DIY his haircut, it's not perfect but at least he's not crying. your son looks great! What a cutie patootie! The hair style really suits him. My youngest had his hair cut here a few times. He liked the car and watching videos. 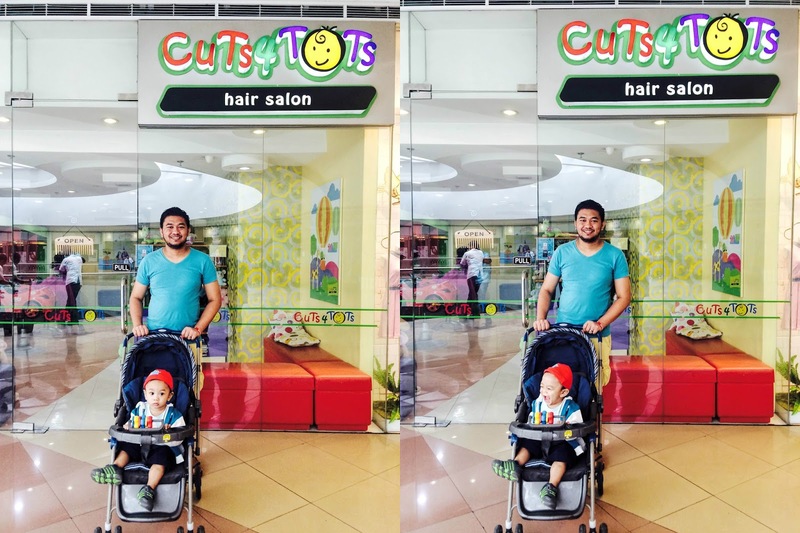 We go to Cuts4Tots for my kids' haircuts too! Naks! Kilabot na ng mga chicks. Its a good thing to be groom than mag mukhang batang hamog. Goodjob! He might have cried at the end but I am sure that during the process of hair cutting, it was a smooth one. I just remember the first time I had my son's first hair cut. He really cried a lot and it took us long to finish the simple hair cutting we aim to give him. But really, the concept of the shop is really friendly for kids which is easier for barbers to do their job. I've been contemplating on Bunny's first hair cut. Some say na we should have it cut but for me there's barely anything to cut. Thanks though for the thorough review of cuts for tots I like that they have a souvenir. We'll definitely take bunny there for her first snip snip!